If you’ve decided to use BPaaS (Business Process as a Service) in a hybrid cloud model as a delivery platform for services, you need to understand how to mesh services together based on the processes you want to execute. 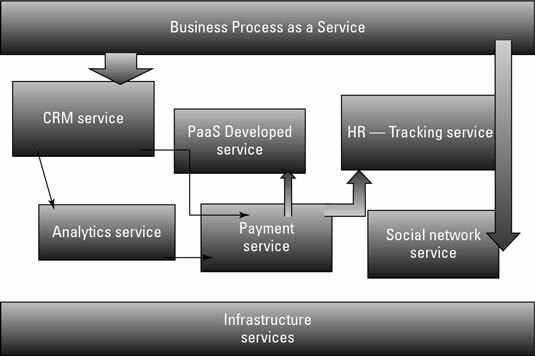 As shown in the following figure, a business process service can be linked to a variety of services ranging from SaaS (Software as a Service) applications, PaaS (Platform as a Service) environments, and IaaS (Infrastructure as a Service). For example, there may be an analytic process service designed to analyze information coming from a variety of CRM and social media applications. Linking services together based on process. BPaaS services allow you to experiment with new business process ideas because they’re not based on programming each individual business initiative. For example, a packaged BPaaS offering that handles business travel processing or order-to-cash processes may be available, as well as other services that will handle load processing or payroll services, and predesigned services useful for everything from processing claims to managing clinical data for drug trials. Like other cloud-based services, BPaaS frees the business and the IT department from having to worry about the underlying services that support the various processes. You don’t have to manage or even know about the underlying middleware, networking, or database. Offerings are created so that security is an element of the solution, not an afterthought. The process services offered by ADP are probably the best-known BPaaS services. ADP helps companies manage their payroll and the accounting and legal aspects related to that process. A company using ADP doesn’t have to be concerned that its payment information will be intermixed with information from other companies. ADP can implement payroll services based on its customer’s specific business process. It’s worth describing some of the businesses that deliver massively scaled cloud applications and business processes. Most of the businesses listed here had to cover uncharted business territory when they developed their service. For this reason, the services they offer may not traditionally be thought of as business services — but that’s really what they are. This service is free when you have access to the Internet. Google also provides an Internet e-mail service, Gmail. Google has quite a few other services, including maps, news aggregation, Google Apps, and so on. These companies are able to support these types of business processes because of the massive data centers they’ve designed to support a specific type of workload. Because their data centers are optimized to support these specialized workloads, they are able to easily support millions of users so efficiently that it’s very hard to compete with them. You might be inclined to think that web-based businesses are somehow different from the companies to which you outsource your energy generation or the companies that provide your communications, but they’re very similar. Be aware that many of these web-based companies started out without a well-defined revenue stream, and some of them have yet to demonstrate a viable business model for their activities. This is currently the case, for example, with Twitter, Facebook, and YouTube, all of which exist just because their investors (or Google in the case of YouTube) believe that they will eventually find a profitable way of operating. Most of the businesses mentioned are dominant in their field because they have established strong barriers to entry and because of their scalable infrastructure and their ability to deliver services at a very low cost. Quite a few Internet auction houses existed before eBay began to dominate the field, and there have been several attempts by would-be competitors to penetrate eBay’s market, but none have made much of an impact.